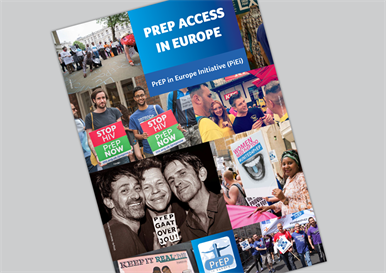 A new report, PrEP Access in Europe, by the PrEP in Europe Initiative, a coalition of leading HIV organisations that includes NAM, calls on European governments and health authorities to make PrEP (pre-exposure prophylaxis) available to populations at imminent risk of HIV as a matter of urgency. PrEP means taking HIV drugs, daily or as needed, before possible exposure to HIV in order to prevent infection. Its high level of effectiveness is undisputed. Following US FDA approval in 2012, many countries around the world – including Australia, Brazil, Canada, Kenya, France, Peru, South Africa and Thailand – are in the process of introducing PrEP for people at high risk of HIV into their HIV prevention programming. According to the European Centre for Disease Control, in 2014 at least 30,000 people were infected in the European Union and 140,000 in the whole of the European region. That’s 80 infections a day in the EU alone. Just over half were among gay men. The new report is testimony that PrEP is being actively sought regardless of country approval. It presents for the first time European gay men’s accounts of how they are trying to protect themselves in the absence of action from their governments. The Initiative’s report contains anonymous testimony from men and women in over 30 countries. They use a range of ways to buy or get ‘DIY PrEP’ (Do it Yourself PrEP) outside of official health systems. The report reveals that this ranges from ‘under the counter’ prescriptions from sympathetic doctors to ‘borrowing’ a few pills from HIV-positive friends. Without official PrEP approval and availability in health care and community settings, gay men risk taking Truvada or even other HIV drugs without knowing their HIV status, STI status, or possible side-effect risk. Many will take PrEP needlessly, or ineffectively. Worse, some will take it when they have just been infected, which risks drug-resistant HIV. Without clear information about how PrEP works, people from communities most at risk will be unable to use and adhere to PrEP safely and effectively. Furthermore, without country approval and programmes for PrEP, the majority of those who need this highly effective prevention method will not know about it or afford access to it. With the recent marketing authorisation to Truvada as PrEP by the European Commission, it is now imperative that European member states start introducing PrEP into their HIV prevention programmes, drawing on guidelines already developed by the World Health Organization, the European AIDS Clinical Society and national HIV associations. In addition, accurate information about PrEP needs to be urgently made available to all people at high risk of HIV to ensure they can get PrEP and take it effectively. NAM has just published a factsheet on how to get PrEP in the UK that provides information on how to go about obtaining PrEP and precautions you can take if buying generic drugs online to ensure that PrEP is safe and effective. The PrEP in Europe Initiative is a coalition of European organisations and activists concerned with HIV prevention, specifically ensuring access to PrEP (pre-exposure prophylaxis) among people at high risk of HIV. The Initiative is run by a steering committee of pan-European advocacy organisations including AVAC, NAM/aidsmap, EATG, AIDS Action Europe, NAT and AIDES. Its mission is threefold: to disseminate up-to-date information on PrEP access in Europe; to influence policymakers and health funders to adopt PrEP in their countries; and to support organisations, groups and individuals advocating for PrEP in their own countries and communities.